SCC ENGLISH: Guerrilla Punctuation Action Group? 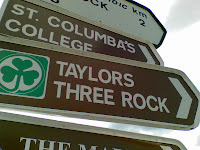 In January 2008 we reported on the mysterious arrival of several apostrophes on the local road signs to the College. 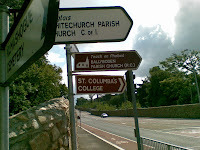 These corrected the egregious 'St Columbas College' official signs, and we pondered on who was responsible - the Punctuation Compliance Standards Department of Dun Laoghaire Rathdown County Council? The Punctuation Militant Front? The Apostrophe Action Coalition? Now it seems that our anonymous punctuation/public signage operative has been at work again. The two remaining signposts to the college to have avoided their rightful possessive apostrophe have been 'dea lt with'. One, at the junction of Taylor's Lane and Whitechurch Road (right), had been removed for over a year while interminable road-widening took place. The other sign (left), at the junction of Grange Road and Brehon's Field Road (the road formerly known as the Green Route), is raised some 4.5 metres above the ground and from the photographic evidence appears to have been the greatest challenge to our nameless servant. Click on the photograph for a closer look. Was it you Julian? Come on admit it! The Department has a strict policy of not commenting on any punctuation-related activities in the South Dublin area. The said action was clearly done in a very speedy, even swift, manner, and there is therefore no photographic or documentary evidence to support any allegation.